His parents call it “the Grey Dude,” the dark persona that overtakes their sweet son, Nicholas, telling him hateful things about himself and clouding him in despair. When a depressive episode sets in, everything is filtered through this smog, and the pain becomes so unbearable that he wants to escape this life. Before the Grey Dude arrived, Suzi and Mark Spelic had a playful, curious kid who did well at his school in Hamilton, Ont., and loved to draw, build models and practise karate. Suzi says Nicholas was born with what she calls “an engineering brain.” He was smart and inquisitive. “He noticed everything and always wanted to know how things worked,” she says. Sure, he was sensitive and a little shy—in social situations, he’d wait for other kids to approach him—but he seemed happy. But as Nicholas got older, his busy mind seemed to turn on him. When he was six, he began worrying about things most kids his age were oblivious to—everything from what his classmates would think of him to the possibility that someone could break into the house and kidnap him. Over the next two years, there were more signs of trouble. At birthday parties, he’d shut down and want to leave. When he was upset in class, he’d bang his head against his desk, and at night he’d wet the bed or have night terrors. If he forgot a move during a karate routine, he’d run off the floor and tell his mom he couldn’t do it. “I’m going to fail. Everybody’s looking at me, and I’m stupid,” he would say. The negative self-talk began to seep into everything he did, with Nicholas routinely declaring that he hated himself. It’s heartbreaking when a child so young develops depression, but Nicholas is not alone. Though most of us think of mental health disorders as an adult problem, 70 percent of them begin in childhood and adolescence. While only about two percent of kids experience depression before their teen years, that number jumps after puberty. And kids are experiencing depression earlier and in greater numbers than before. In the US, the number of 12- to 17-year-olds who dealt with a major depressive episode increased from 8.7 percent in 2005 to 11.3 percent in 2014. Everything from genetics to bullying can contribute to depression, but many experts are making connections between the rise of the mental illness with the increase in kids’ use of screens and social media. The trouble is, young kids often don’t yet understand their emotions or know how to express them, which can make it extra difficult to notice when the Grey Dude first arrives. And yet it’s vitally important to catch the illness in these formative years, before the darkness takes hold. Nicholas’s depression seemed to settle in when he was in grade two, but at first, all the signs pointed toward a physical illness. “He was getting stomach aches and really bad headaches and not wanting to go to school,” recalls Suzi. Though depression is a mental illness, it’s not unusual for kids to experience physical symptoms, like tiredness and tummy aches, or changes in their eating or sleeping habits. When a child is suffering from depression, they might withdraw from their friends, begin performing poorly at school or experience a change in activity level. While adults with depression are likely to become lethargic, kids are more liable to be hyperactive, says Robert Bancroft, the advanced practice clinical leader of social work at the Centre for Addiction and Mental Health (CAMH) in Toronto. Sarah Cannon, who lives in St. Catharines, Ont., lost her husband to suicide when her daughters, Amy and Emily, were two and five years old. Emily had shown signs of mental health issues by two years of age and was diagnosed with bipolar disorder when she was five. When Amy began having angry outbursts at 12, Sarah initially chalked it up to the volatile situation of living with years of grief and a sibling with bipolar disorder. “Something would happen to trigger the emotion, and then she’d go to the extreme,” says Sarah. As a tween, Amy would “spew venom.” She seemed angry, not depressed, but after years of experience with Emily, Sarah recognized that her daughter’s rage was caused by a deep sadness. After Amy tried to overdose on pills at age 13, she was diagnosed with depression and anxiety, and got treatment. Now 17, Amy has worked hard to find stability and develop tools to help regulate her mood. She has begun to explain to her mom why she acted so angry when she was sad. “She said, ‘One of the reasons I did that is because I know I’m going to die, and I know I’m leaving people behind who will be sad. I had to make it so that when I die, you guys would be relieved,’ ” Sarah says. What’s causing depression in kids? Questions around why a child developed depression can keep a parent up at night, wondering what they could have done differently, but there’s usually a combination of factors. Experts look at things that span a child’s biology, psychology and environment, including genetics, trauma, abuse and relationship issues. “It ends up being quite a complex matrix,” Bancroft says. Conditions like anxiety and ADHD can increase the risk. Hormones also seem to play a role, and girls are significantly more at risk for developing depression, particularly after puberty, when their risk doubles in comparison to boys. Since girls are starting puberty earlier, depression is also showing up sooner. “Though not very common, we are seeing depression in nine- and 10-year-old girls who have started puberty early,” says Miller. Unfortunately, most of the factors are out of our control, but one risk factor parents can keep in check is kids’ use of technology. “There’s a theory that the introduction of smartphones and kids’ use of them coincide with more mental health concerns,” says Bancroft. Psychologist Jean Twenge has been a leader in exploring this link. She analyzed a survey of 1.4 million teens and found that those who spent more time on screens and social networking sites had an increased risk of loneliness, depressive thoughts and unhappiness. In another study, Twenge reported teens who used devices in excess of three hours a day were 35 percent more likely to have at least one suicide risk factor. There’s a dearth of research on kids under 12. But the average child receives their first cellphone at age 10, nearly half of kids under nine have their own tablet and most toddlers know how to navigate their parents’ devices—it’s likely issues could be developing earlier. There are also biological reasons screens may be affecting kids’ moods. “Having a device in your bedroom at night that interrupts your sleep can really wreak havoc on moods,” Miller says. “Sleep deprivation can cause depression, and most kids and teens need much more sleep than we think.” (Six- to 12-year-olds need nine to 12 hours a day, while teens need eight to 10.) What’s more, the apps they’re using could be creating the unhealthy habits of continually comparing their lives to the perfect ones they see on Instagram. “There’s this constant social world of their friends texting each other, and they don’t want to miss out,” says Miller. Suzi has tried to ease the burden of social media in Nicholas’s life by monitoring his accounts and ensuring his Facebook “friends” are actually friends. “He had a situation where a kid sent him a rude message. So we went through Facebook with him and we took off everyone who wasn’t really his friend.” When Amy is going through a crisis, her mom says taking away her phone just sends her further down the spiral of despair. “So I don’t take her phone away, but I’ve said to her, ‘Why don’t you put it on airplane mode, just for a couple of hours?’” says Sarah. At the same time that kids are grappling with the new challenges brought on by carrying their social circles in their pockets, they also seem less equipped to cope. Kathleen Pajer, chief of psychiatry at the Children’s Hospital of Eastern Ontario, says more kids are turning to hurting themselves to deal with the stresses in their lives—whether they have a mental illness or not. “There is a huge increase in visits to the emergency room and in-house admissions for mental health problems. And when you start to look at kids’ reports of how they feel, there’s an increase in some types of problems, like feeling suicidal,” says Pajer. According to a US study published in Pediatrics this past May, suicidal ideation and suicide attempts are a growing cause for kids’ hospital visits, accounting for nearly two percent of visits in 2015—more than double what they were in 2008. Bancroft has seen an increase in kids who practise self-harm, like cutting, or who talk about wanting to die, but when a formal risk assessment is done, the majority don’t actually want to end their lives. Of course, any time a child mentions suicide, caregivers should take it seriously and seek immediate help. Bancroft explains that for some kids, harming themselves isn’t a desire to die but a craving to feel something—anything—amid the numbness of the disease. Suzi and Mark rushed him to the emergency room, and their paediatrician got him into a local mental health program. Within a year, his psychiatrist diagnosed him with major depressive disorder. Nicholas saw a psychologist for therapy and was given worksheets to help him learn to recognize and cope with his emotions. Suzi took courses on anxiety, mental health first aid and emotion-focused therapy. She learned about tools, like a fidget box, that can help distract Nicholas from the sadness before it gets out of control. Because his depression was so severe, he was also put on Prozac, which helped ease the pain. Sarah attended classes in psychosocial rehab to learn how to support people with mental health conditions through recovery—so she would have the skills to help Emily and Amy. She says Amy’s depression can come on so quickly at times that she needs the tools to help her on her own, and she has turned to private therapy so she can get her daughter in to see someone fast when needed. “There are times when she’s said to me, ‘I feel like I need someone to talk to,’ and there isn’t somewhere we can go in that moment,” says Sarah. “I sort of armed myself, so she can come to me and hopefully I can stabilize her or at least know when it is more of an emergency situation.” Many days are still a struggle, but Amy has worked hard to learn self-regulation. Depression is actually quite treatable through psychosocial therapies, Bancroft says, though it is something most patients will struggle with their whole lives. Parental involvement is key. He says many kids who are treated for depression will start with cognitive behavioural therapy (CBT), which helps patients challenge “cognitive distortions,” those hateful thoughts that kids like Nicholas have, telling them they’re not good enough, smart enough or likeable enough. 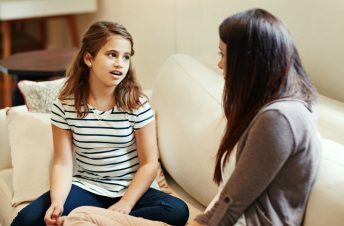 Using CBT also helps kids develop effective communication and problem-solving skills, which can empower them to feel less helpless and hopeless. “When we offer care here [at CAMH] for kids this age, the parent and child arrive together,” says Bancroft. “We may start a session together briefly, sort of touch base on how the week has been, and then the child has their own curriculum. The parent is informed about it so they understand it well, and then we end the session by coming back together for some conjoined work.” Medication is less commonly used as a treatment for kids with depression, but it is sometimes prescribed if other approaches have been unsuccessful. Suzi has learned how to better parent a kid with depression, but that doesn’t mean it’s easy. In grade six, after being diagnosed with ADD and facing bullying at school, Nicholas regressed. Suzi pulled him out of school and began home-schooling him. Today he’s 13, doing online classes and facing further challenges. After exhausting the programs he was receiving treatment through, he’s waiting for a new psychologist. Suzi does what she can, always reminding her son about the truly wonderful person he is behind the dark clouds. That’s why she began calling his depression the Grey Dude—to reinforce to him that it’s an illness, it’s not him. “So it wouldn’t completely destroy him,” she says. But then, he’ll miss a throw and the self-blame will come right back again. Unfortunately, Suzi knows there are no easy answers for her son. Be strict about screen time. Kathleen Pajer, chief of psychiatry at the Children’s Hospital of Eastern Ontario, recommends setting aside device-free periods. She also suggests shutting off all devices two hours before bed to prevent the blue light from affecting sleep. “Not getting adequate sleep is a major risk for depression, and it certainly will make depression worse,” says Ashley Miller, a psychiatrist with the Mood and Anxiety Disorder Clinic at BC Children’s Hospital in Vancouver. Get active as a family. Physical activity is known to protect against depression. Pajer suggests going for walks after dinner or finding other activities in which you get fresh air and exercise as a family. Make time for family dinner. Research shows having dinner together contributes to better emotional well-being in kids. Play outside. Nature can have a protective effect on mental health. Some studies have found outdoor physical activity improves mental health for both kids and adults. – Look for a local mindfulness meditation program for kids. Practising mindfulness can help prevent episodes of depression. – A mental health first-aid course can help you recognize illnesses like depression, engage your child about their feelings and get them the help they need. Go to mentalhealthfirstaid.ca. to find a training program near you. – Look for a therapist who practises emotion-focused family therapy. This training teaches caregivers to help kids recognize their emotions and learn coping skills. – The website Dealing With Depression (dwdonline.ca) teaches kids about depression and how to handle it, including skills like identifying depressive thoughts and problem-solving. The post Depression is on the rise in kids—but the signs are hard to recognize appeared first on Today's Parent.